I'm so excited to share probably my all-time favorite sewing project for kids today! I have been waiting years for the chance to make one of these for my own kiddos and then when the moment strikes I find myself in a mad dash to get it done. Standard, standard. Anyway, it's been a big, big week at Chez JSO. 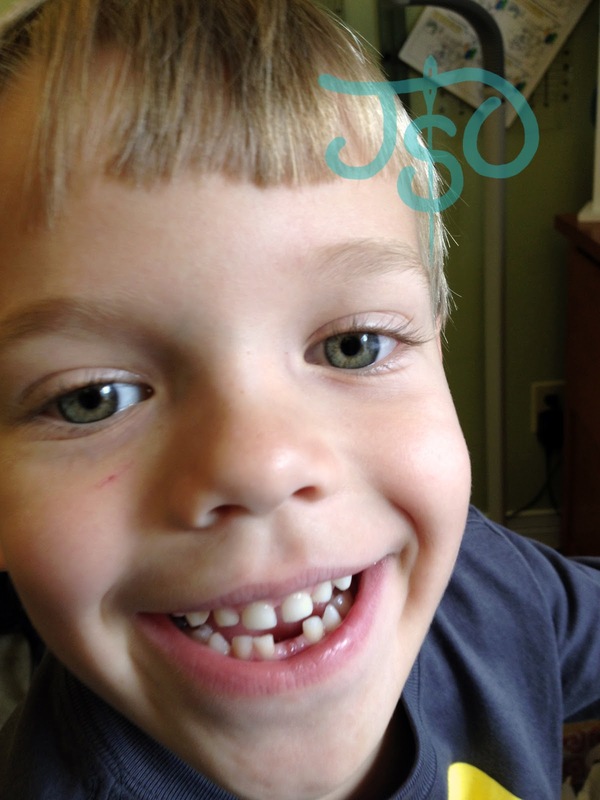 Big Boy lost his first tooth Sunday so it's time for a Tooth Fairy Pillow! 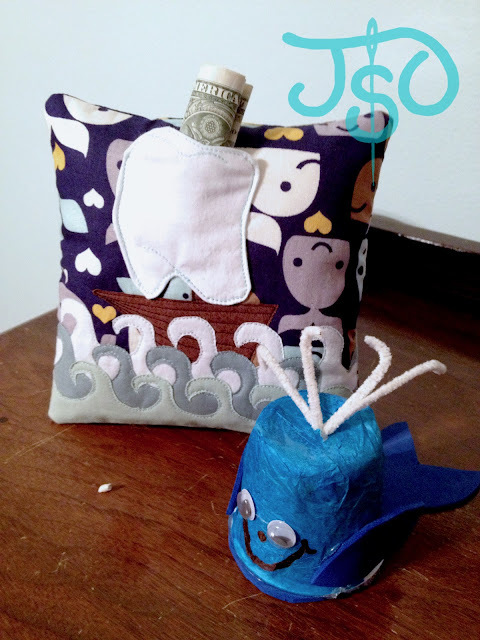 See, instead of putting the tooth under his pillow, where it might get lost, he now has his very own designated pillow with a small pocket just big enough for the tooth...and then for a little moolah. That way, the winged lady has no problem making the drop. Our Tooth Fairy has another cool tradition: On Halloween night, the kids put their buckets of candy just outside their bedroom door and go to sleep. 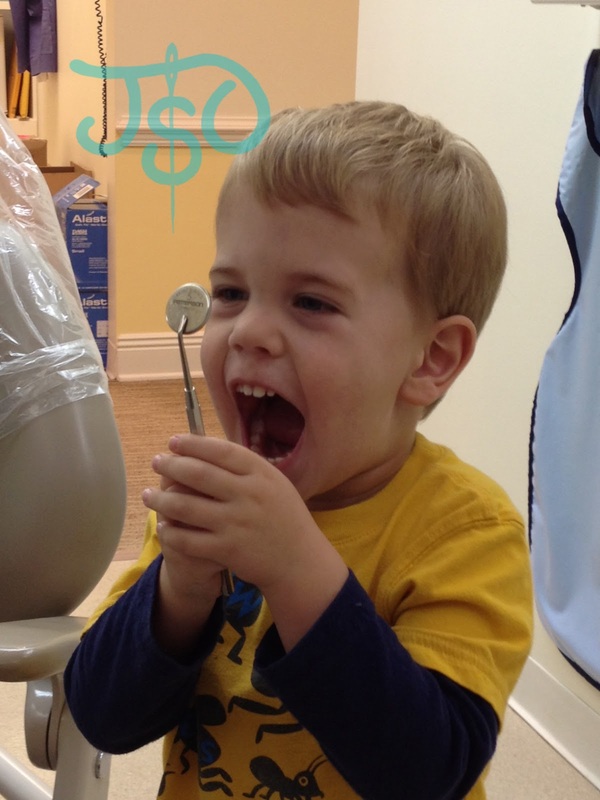 When they wake in the morning, the Tooth Fairy has replaced all that sugary stuff with a new toy! (We're not total ogres...we let them set aside five pieces of candy to keep before they relinquish their booty.) They love it, our dentist loves it and we love that they can participate in the fun of trick or treating without the six-day sugar rush that follows. Pretty much every sewing project inspires me to go out and buy new fabric, but I'm trying desperately to discipline myself this year and start with my stash. 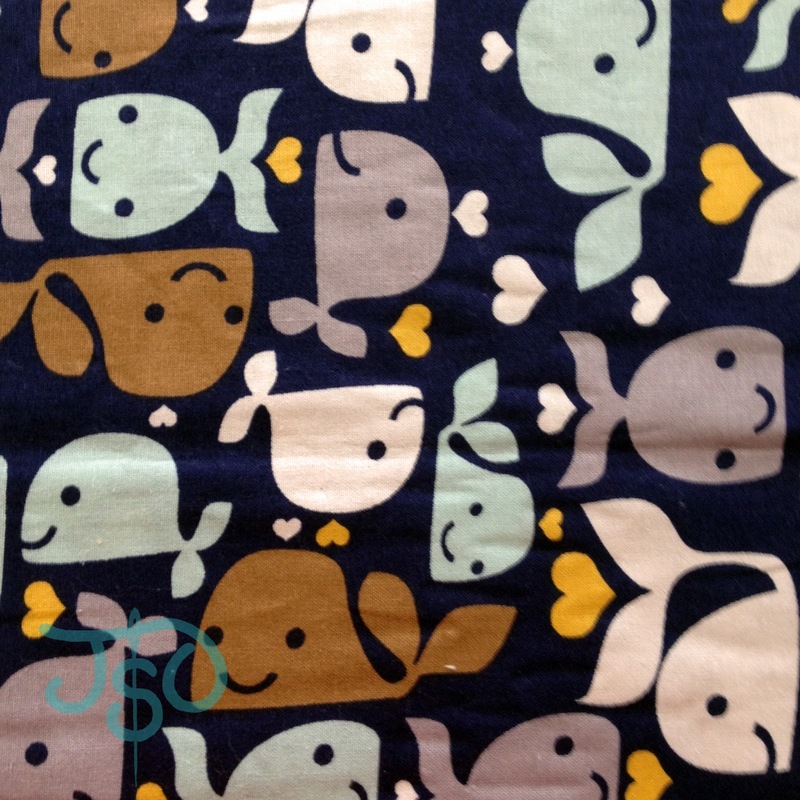 Big Boy has a whale fabric he picked a few months ago that I have yet to use, so I jumped on that as a starting point. I wanted something pretty graphic, which called for a new technique -- new to me anyway -- of raw edge applique. 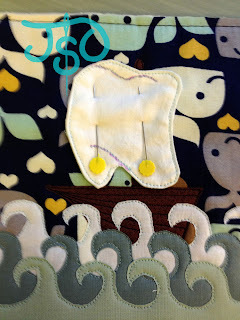 So I found this Jamaica Vanilla quilt raw edge applique tutorial on YouTube. The video quality isn't the greatest, but I liked her approach. 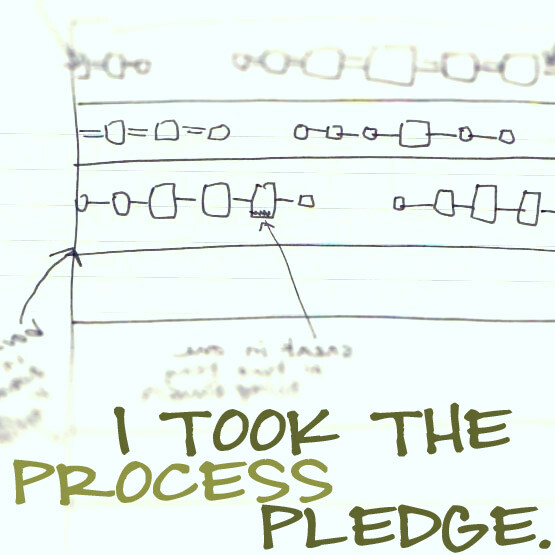 First, I needed a plan. 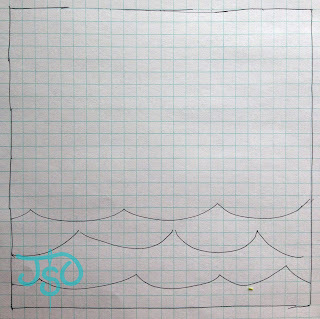 I started with a 6 x 6 surface with waves at the bottom. 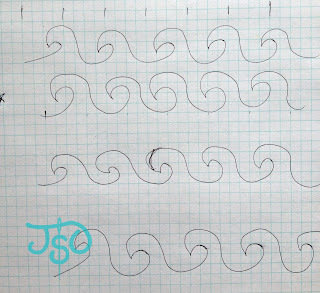 Then I decided stylized waves would be cooler, and since I'm doing raw-edge, there are no limitations on shape! I had to find some kind of vessel for the tooth. I kicked around putting a moon in the sky, but that didn't seem like the right approach. 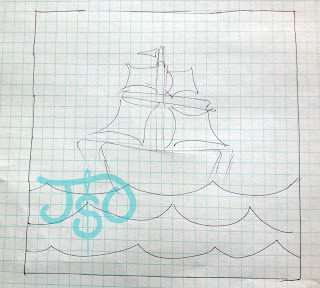 Then I thought about a ship. 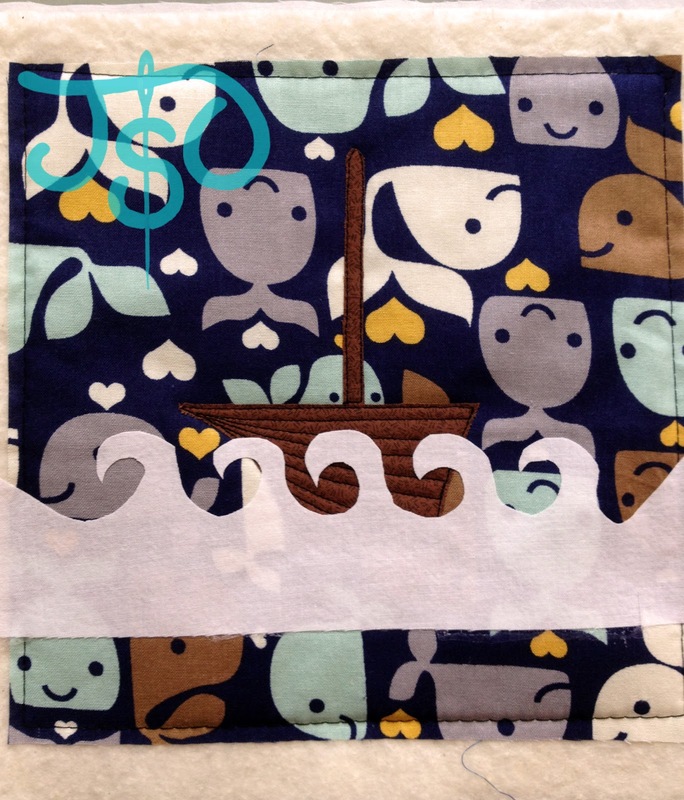 The sail could totally be the pocket! Hmm...but what kind of ship? How complicated should this get? 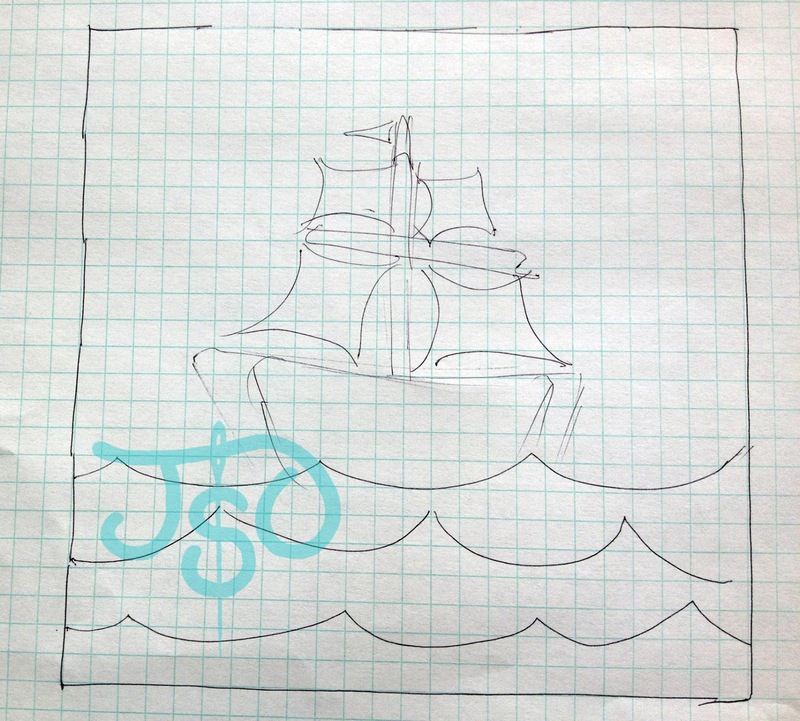 I wanted to go for a tall ship, but that seemed a bit much, both for my time crunch and the size of the surface. I stumbled across this ancient Asian-looking version and fell in love. 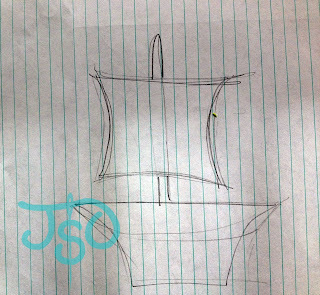 The single sail in a more or less square shape would work perfectly. 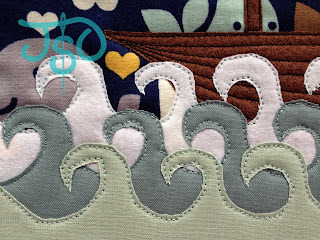 First, I cut some fabric for the background and waves. 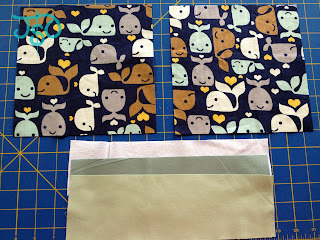 Two 8 x 8 inch panels of the whales and one roughly 3 x 8 inch panel of three different fabrics for waves. I drew the other parts and pieces on the matte back of my freezer paper to prepare for my raw edge applique process. 1. 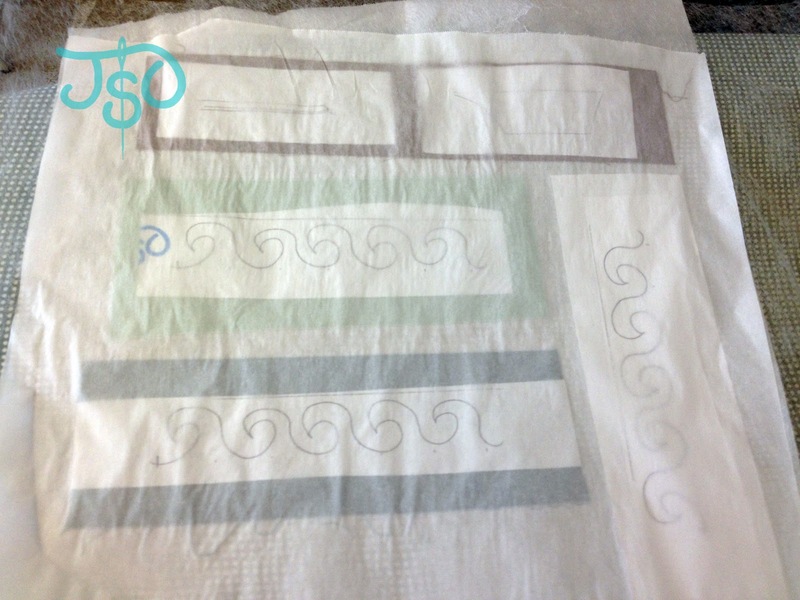 Rough cut a square around your applique motif as drawn on the freezer paper. Don't get into the details yet. 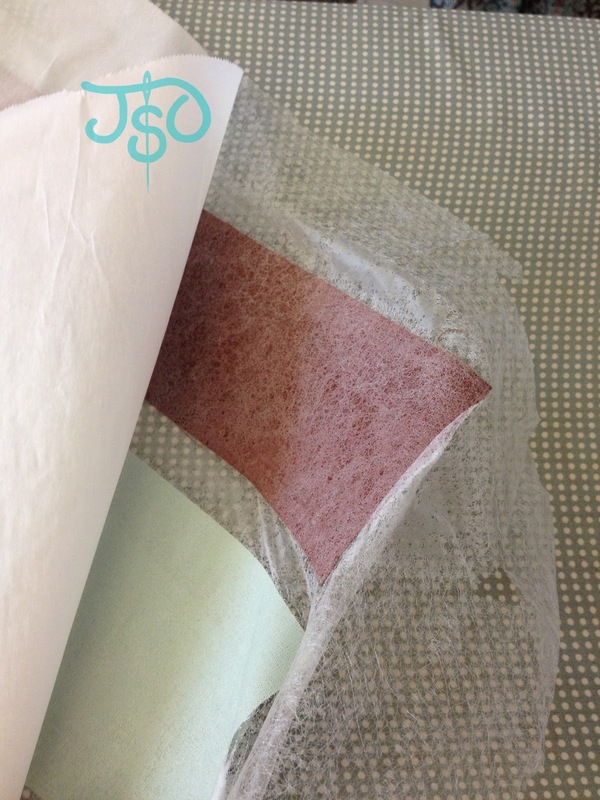 Fuse the shiny side of the freezer paper to the RIGHT SIDE of a scrap of the desired fabric. 2. On your ironing board, stack the parts and pieces in the following order: parchment paper, Misty Fuse (or equivalent), fabric-freezer combo with the fabric's WRONG SIDE against the fusible, and a top layer of parchment paper. 4. Allow the layers to cool, then peel the parchment paper from top and bottom. 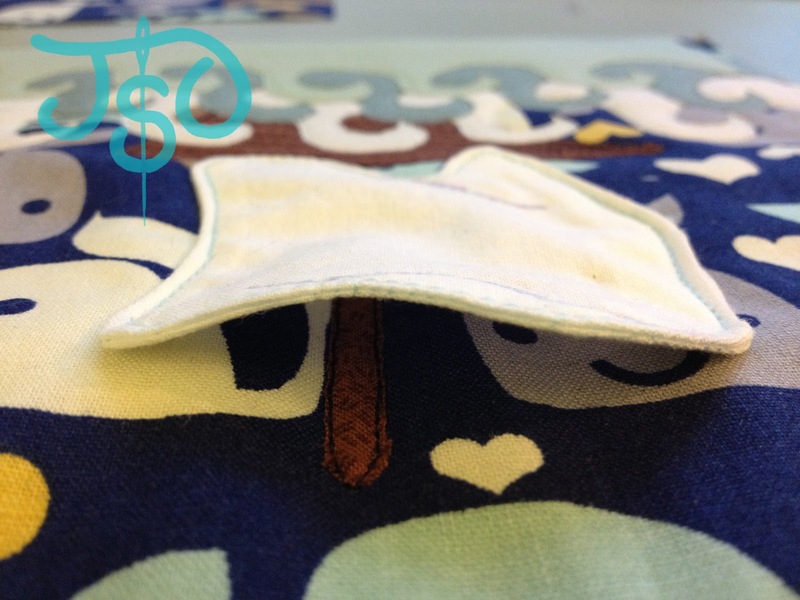 If you've done it right, the wrong side of your fabric should look "webby" with the fusible. 5. 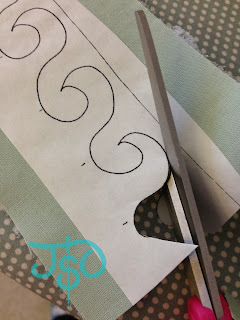 Using paper scissors, if you have any sharp enough, cut your applique pieces using the lines on your freezer paper as a guide. After your pieces are all cut out, peel away the freezer paper. Now it's time to put it all together. I want Big Boy's pillow to have that soft, puffy quilted look, so I needed to actually quilt the top of the pillow as I appliqued. To do that, first pull everything off the background fabric. 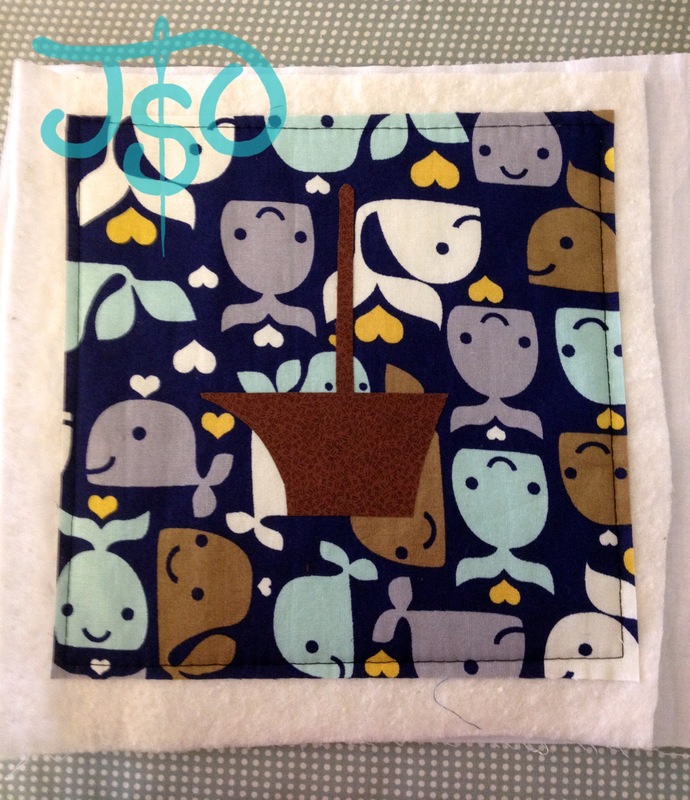 Put together a quilt sandwich that includes a generic backing fabric on the bottom (this will be inside the pillow and not visible -- I used white), the batting square in the middle and the background fabric (whales) on top. I basted the layers together around the edges with the largest stitch my machine offers. That will keep the layers from shifting as I applique. 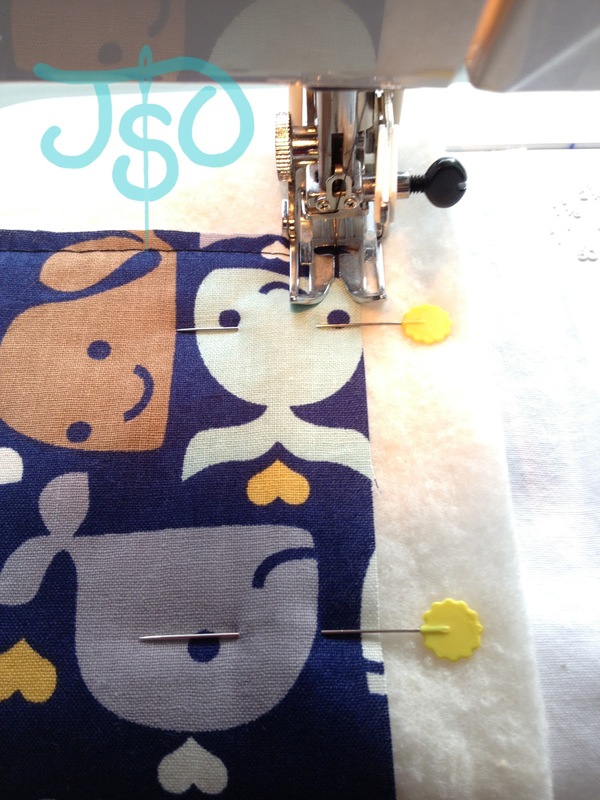 Next, put your test layout on top of the quilt sandwich again, but this time, remove it one piece at a time until you get to the bottom-most piece. You'll stitch the individual pieces down in order from bottom to top. If you stitch the waves first, you can't ever get the boat back under there! 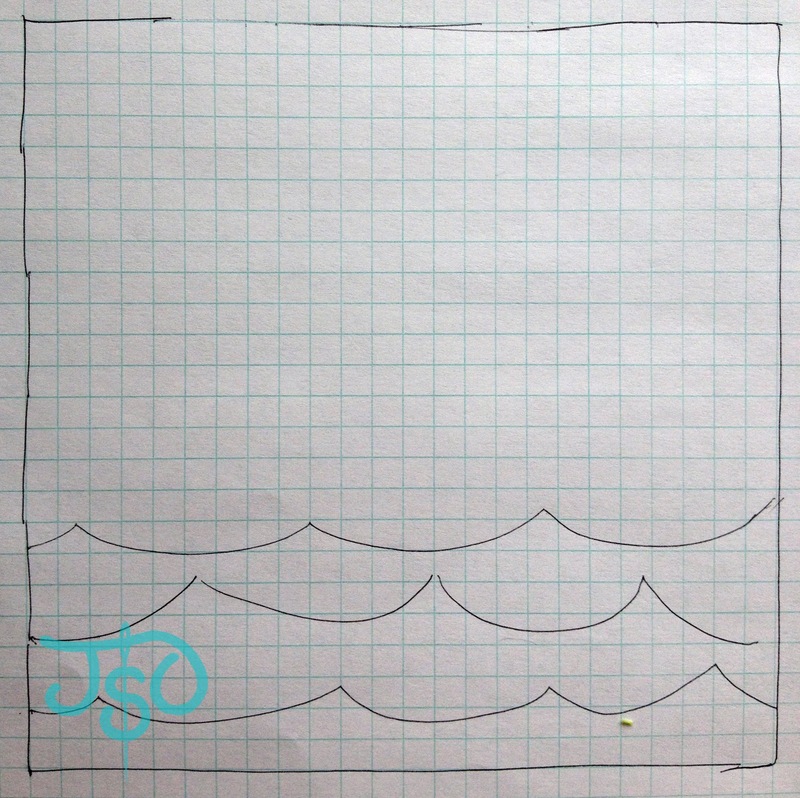 Or you could put the boat between two layers of waves. (That would've been pretty cool, actually.) 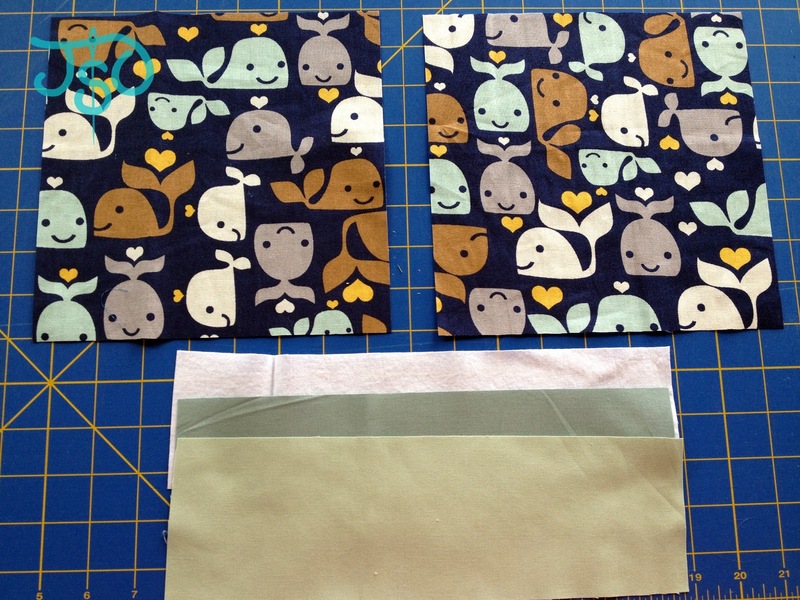 Here's where that fusible comes in: Iron the piece you're ready to stitch down to the background. 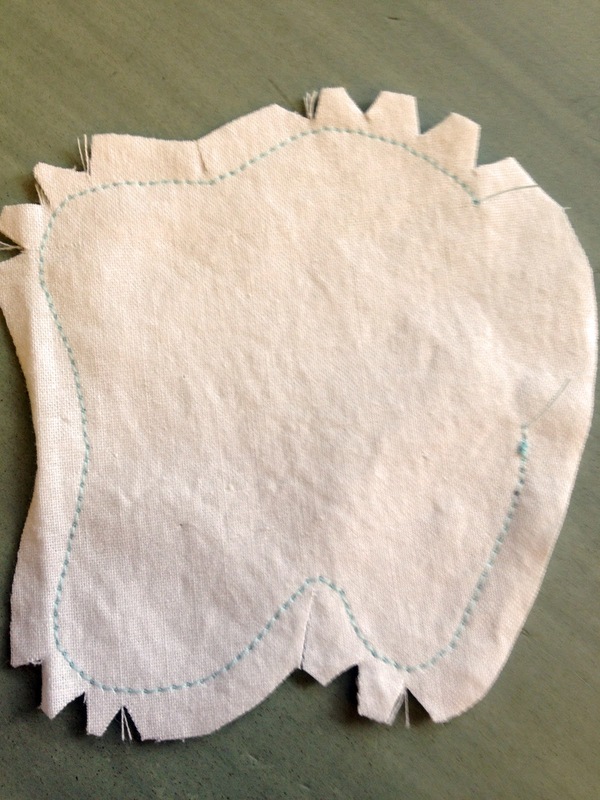 The fusible will hold it in place without making it stiff. Use a light touch with the iron, though. You don't want to smoosh all that delightful puffiness. I stitched the boat first. 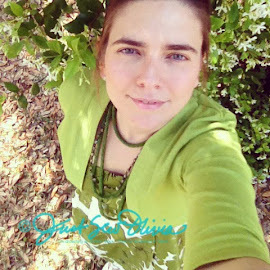 Be sure to use your thread to stitch some texture into your picture too. I drew the boards that make up the ships hull. 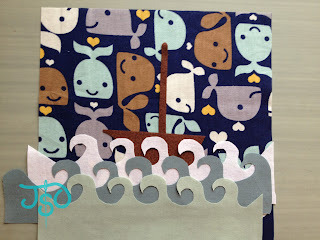 Repeat by appliqueing each layer of your picture in order until you get the entire pillow top complete except the sail. The sail will be a pocket for the tooth, so we don't want to applique it down! I started out using my walking foot to applique (white row), but I figured out pretty quickly that I needed more visibility. After that, I tried my free motion stippling foot and dropped my feed dogs (dark gray row). I could see better, but without a stitch regulator I'm not the most consistent stippler on my domestic machine. Lastly, I tried out my clear embroidery foot and raised the feed dogs again (light aqua row). 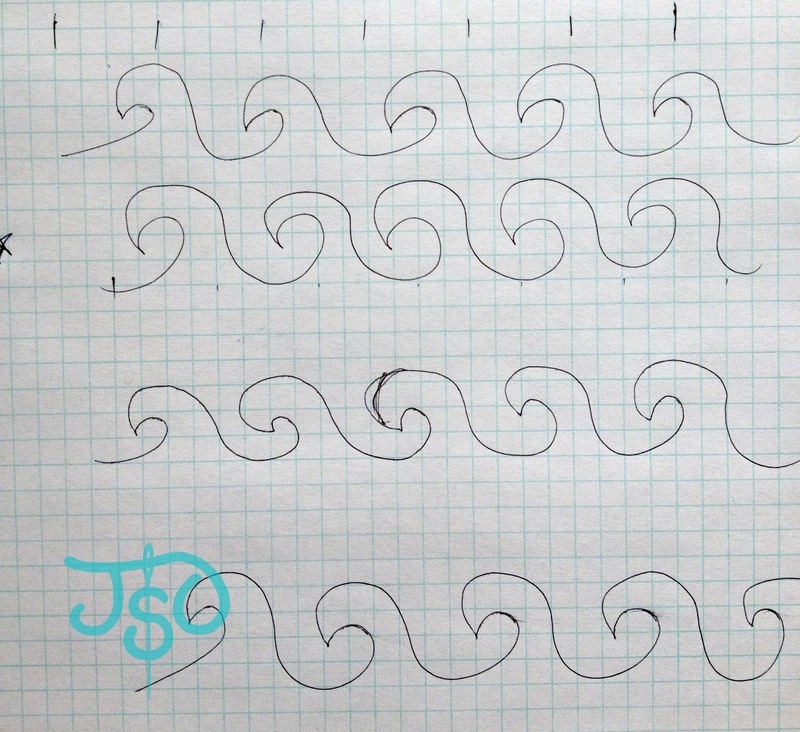 That method delivered the most consistency in the stitching and ended up being my favorite. 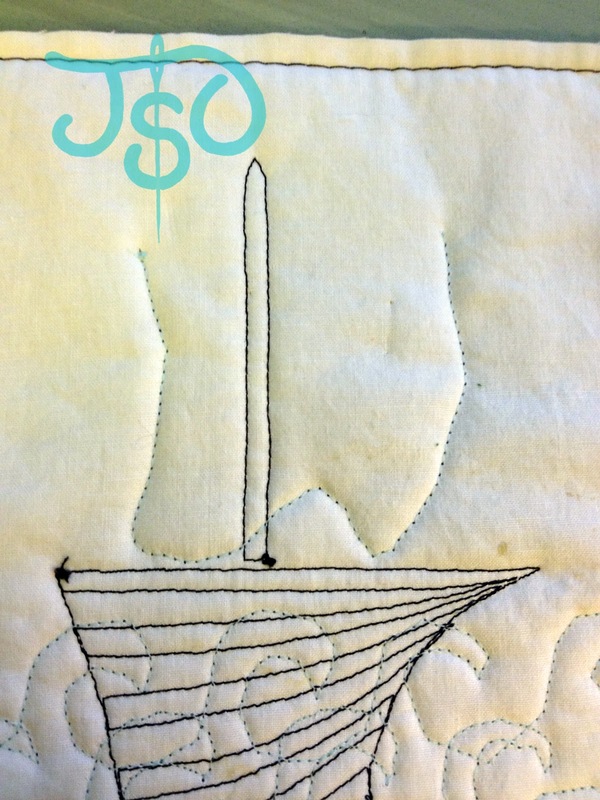 After the boat and all the waves were stitched down, I had to decide what to do about a sail/pocket. A great debate overtook the process. 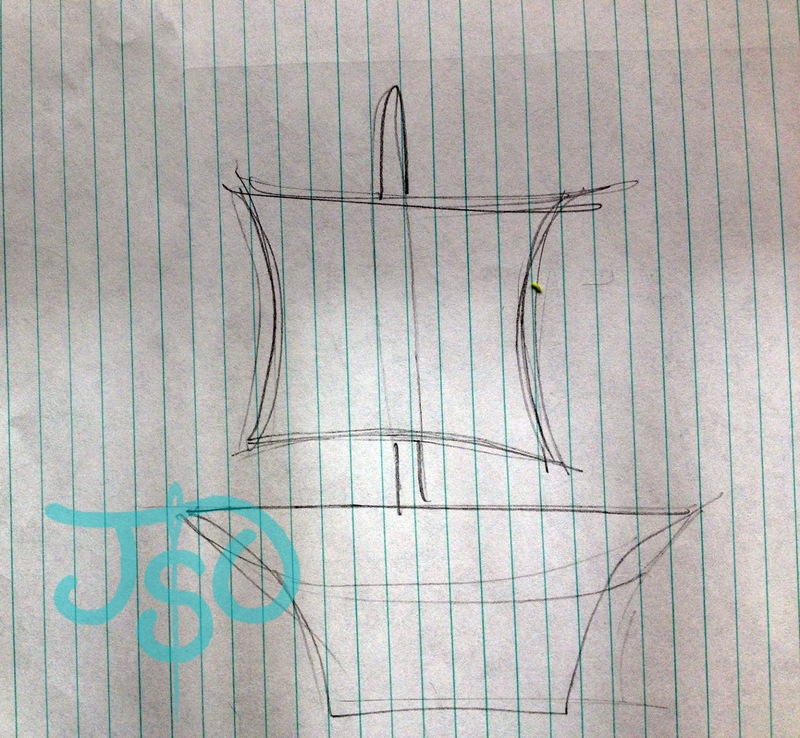 Should the sail look like a normal sail? 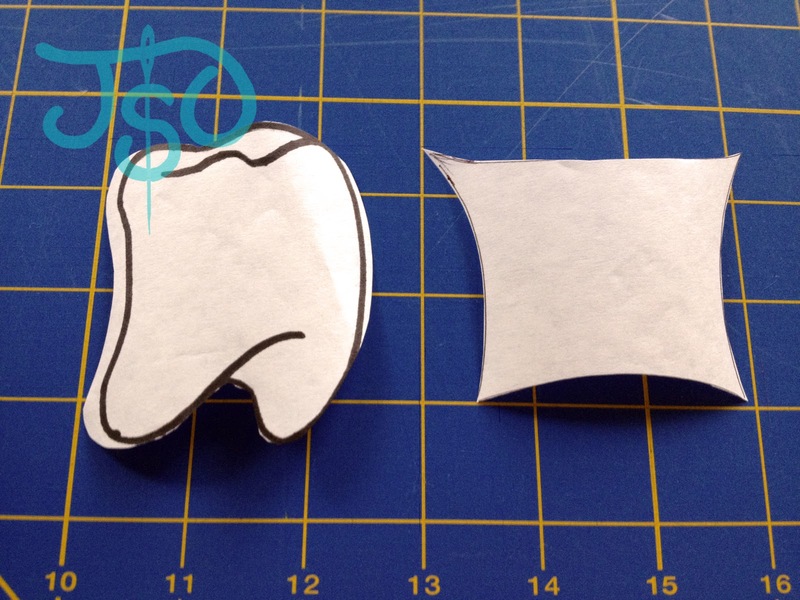 Or should it be shaped like a tooth? 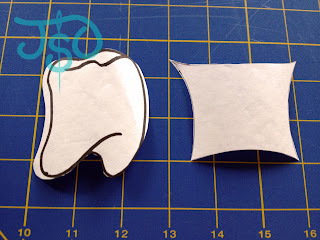 I settled on a tooth styled to look like a sail. Now the sail/tooth/pocket can't be raw-edge appliqued, because it won't be attached all the way around, and you want the lip and inside to be as nice as the outside. 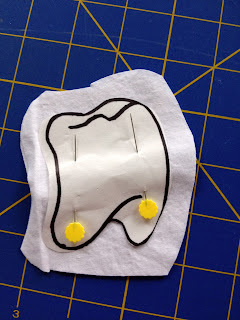 So I made a complete tooth unit inside and out. The easiest way to get from the drawing to a tooth-shaped pocket is to lay the pattern (drawing) down on two layers of your fabric, pin and trim around the drawing leaving 1/2 inch seam allowance. 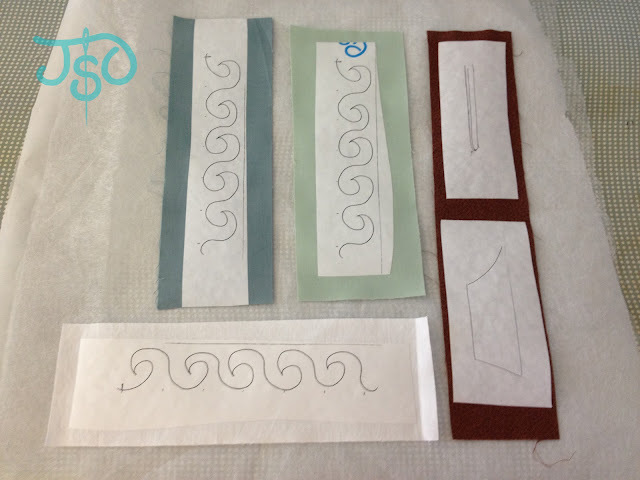 I use freezer paper to make pattern pieces, so I was able to actually press the pattern piece to the fabric using the shiny side and then just stitched right around the pattern piece. I stitched it RIGHT SIDES together, leaving a gap for turning. 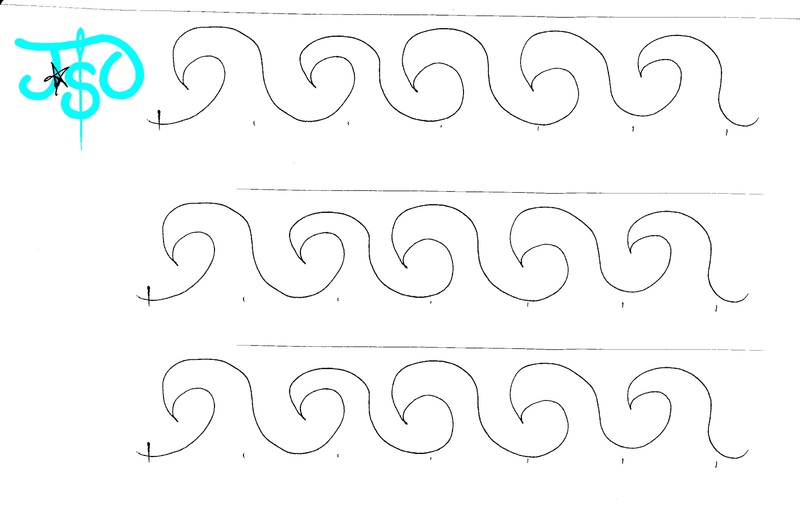 Then I clipped and notched the curves so it won't lose its shape once turned. I took a few minutes to place the pocket in just the right spot. I have some heartburn with how it turned out, but I'll get to that in a sec. I do love the tooth, though. 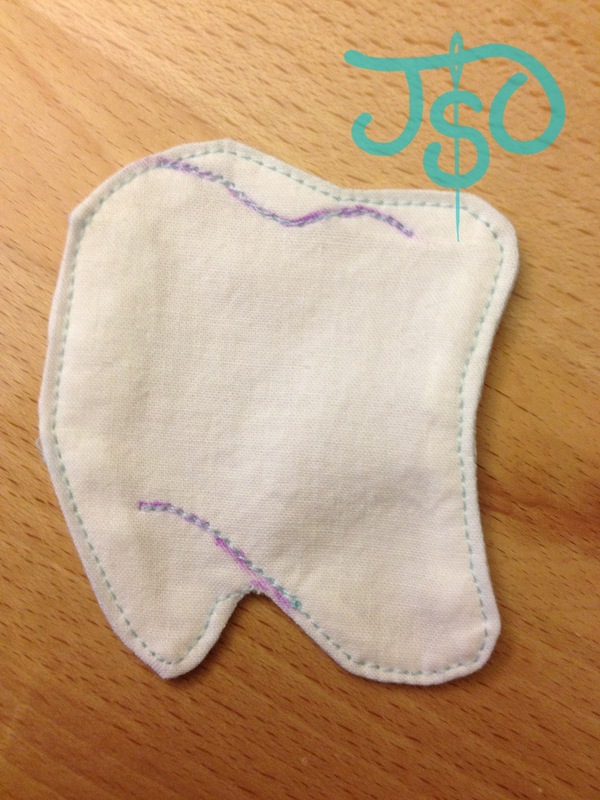 You can take the last step to completing the top of your tooth fairy pillow by top-stitching the pocket to the pillow top. I stitched around three sides of the tooth. You can see it better from the back side. It's just the right size for a tooth and some money! 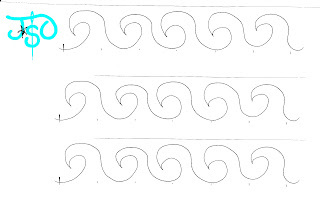 If I had to do it over again, I'd put the hull of the boat between the top and middle layer of waves, giving it a little more dimension and allowing me to move the hull down a bit. 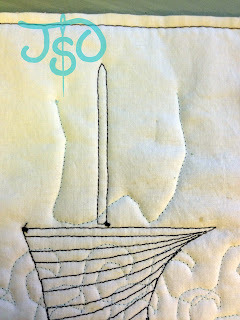 I might make the pillow a tad bigger, and I would definitely make the mast longer. 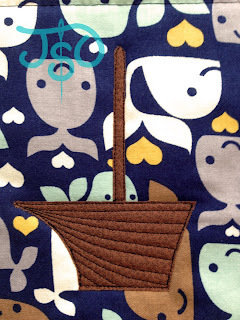 Once I put the pocket/sail on, I felt like the mast (and really the entire boat) were lost a little. Still, for an original design and first time with raw-edge applique, I'm really happy with it. More importantly, the Boy is thrilled. We're all set for the tooth fairy tonight!